Photo by Janelle Patterson Marietta Police Officer Glen McClelland and K-9 dog Edo demonstrate suspect apprehension with Brandon Burnwort, during a Marietta Noon Lions dinner event Thursday. Photo by Janelle Patterson Marietta K-9 Edo latches onto Marietta Noon Lions President Brandon Burnworth at the Lafayette Hotel Thursday during a demonstration for the Lions Club. Photo by Janelle Patterson Marietta Police Officer Glen McClelland helps Marietta Noon Lions President Brandon Burnworth don a bite suit at the Lafayette Hotel Thursday during a K-9 demonstration for the Lions Club. 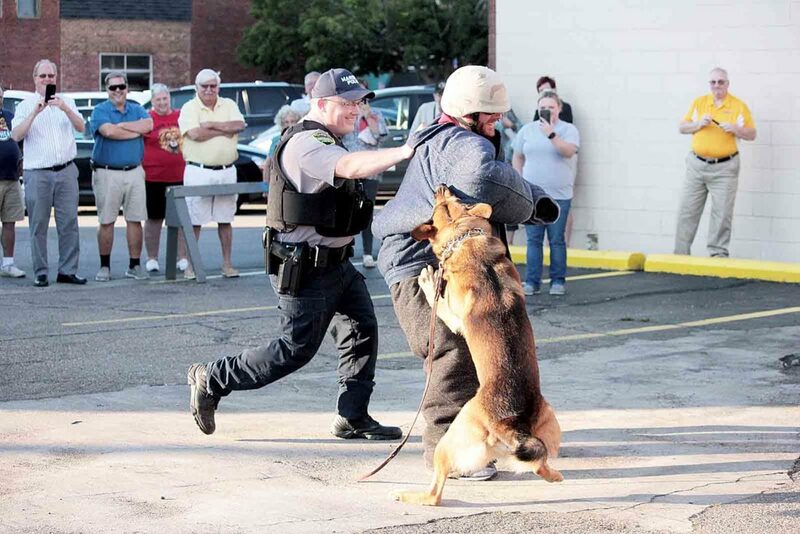 MARIETTA – Marietta Police’s K-9 unit took a bite out of the Marietta Noon Lions dinner Thursday, or at least the president of the service organization. 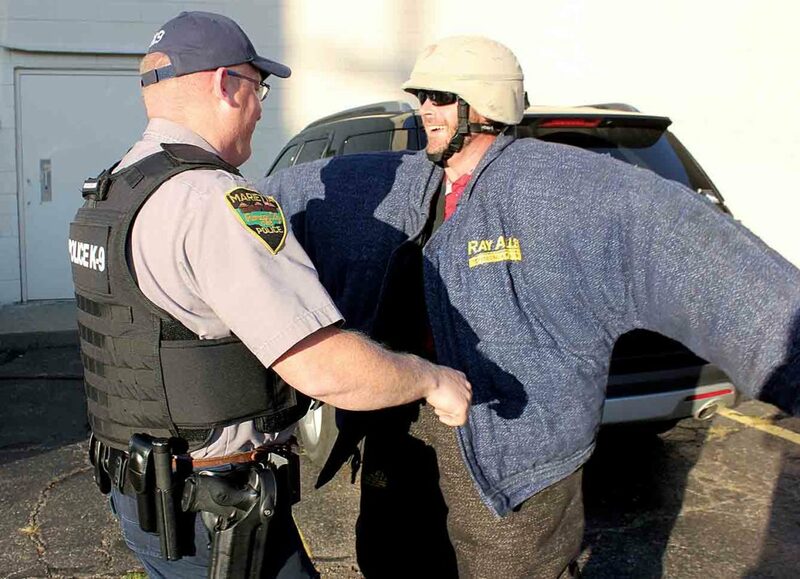 Thirty-six-year-old Brandon Burnworth, the third Burnworth to hold the office, suited up and even wore his combat helmet for the demonstration with Edo, the trained police dog of MPD. The Noon Lions focus its service in five primary areas, he explained, sight-saving, environment, childhood cancer, diabetes and hunger. “But we have a good time doing it,” Burnworth added. McClelland said he was happy to join the club for dinner Thursday and is always willing to provide demonstrations with Edo. 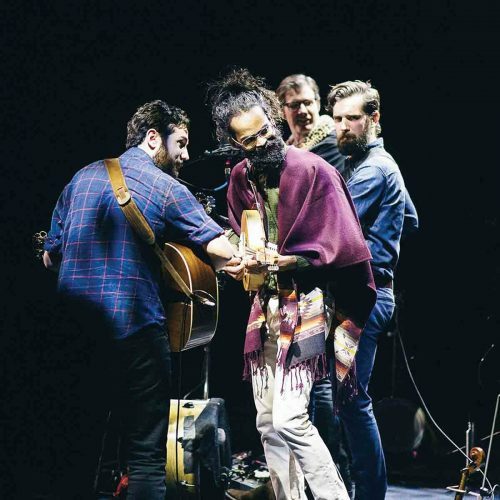 But before Edo, who recently turned 6 years old, could jump on Burnworth and earn his treat, McClelland was peppered with questions from the 32 Lions present as they built up the hype for the big demonstration. 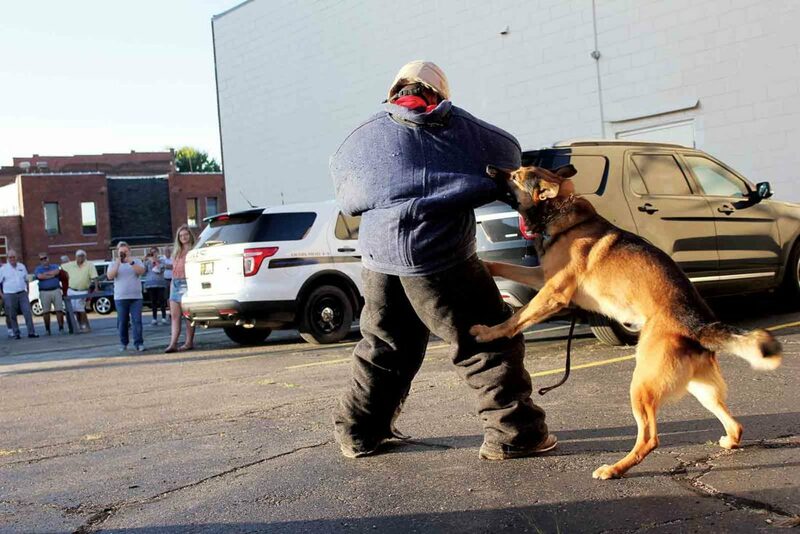 Some offered questions on training, on how different drugs are detected, while others asked how hard the bite of a police dog can be. Even Brandon’s father, and a former president of the club, Washington County Common Pleas Judge Randall Burnworth got in on the fun. “I’d pay extra to have it go on an extra 30 seconds,” laughed the judge. McClelland explained that Edo is a mixed breed, called a Belgian Shepherd, and has the strength of German Shepherds but is smarter because he has Belgian Malinois in him. “Edo is a bigger dog,” he began. “Oh, great,” interjected Brandon to the raucous laughter of the club. 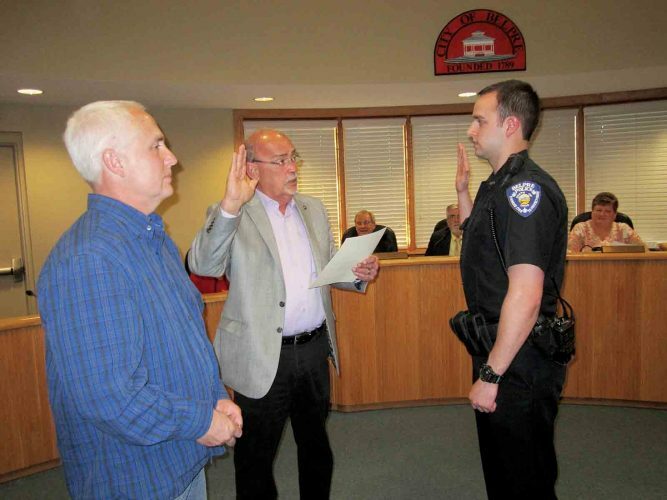 McClelland explained that Edo is trained as a dual-purpose police dog in narcotics detection, tracking, article search, building search, area search and suspect apprehension. He also noted that the pair is nationally certified and retrained yearly so as to aid in investigations and apprehension across state boundaries. Following the dinner the crowd gathered in the back parking lot of the Lafayette Hotel to watch Brandon suit up and run from Edo–and the teeth came out. Edo jumped up to bite Burnworth three times but didn’t take him to the ground.